A LATVIAN HERO: Margers Vestermanis receiving the Austrian Holocaust Memorial Award. Margers Vestermanis, a legendary custodian of Latvia’s Jewish community, celebrated his 90th birthday on Sept. 18. To mark the occasion, Austrian Ambassador Dr Arad Benko presented him with the Austrian Holocaust Memorial Award in honour of the work Vestermanis had done to revive Jewish culture in Latvia. The award is the latest in a long list of recognitions for a man renowned in Latvia for his bravery and perseverance in the face of extreme hardship. Back in 1941, when Latvia was invaded by the Nazis, Vestermanis was taken to the Riga Ghetto at the age of 16 and was subjected to slave labour. He was then detained at the Riga-Kaiserwald concentration camp, as well as the Dondangen and Poperwahlen camps. But in late July 1944, he escaped. He got away during one of the infamous “death marches” towards the end of the Second World War, finding refuge in Latvia’s forests, and quickly joining up with the resistance movement. He was the only one in his family to survive the Holocaust. Once the war ended, Vestermanis devoted his life to keeping the memory of Jewish people in Latvia alive, studying history in Riga during the following five decades of Soviet rule. In 1989 — with Latvia still part of the Soviet Union, and with political restrictions easing slightly — he founded the museum Jews in Latvia. The museum, which Mr.Vestermanis considers to be his major life achievement, was initially intended to be a living memorial to the Latvian Jewish community, most of whom had died during the Holocaust. Later, however, the focus was broadened to include the whole of Jewish history in Latvia — a rich and diverse history that spans almost five centuries. The first permanent exhibition, unveiled in 1996, was a sensation; though it was not without controversy in Latvian society, which had been slow to come to terms with the fate of Latvia’s Jews during the Second World War. Today, the museum is run by Latvia’s Jewish community and has a collection of more than 15,000 units; it is visited by up to 10,000 people a year. The museum has also become a key part of Riga’s cultural life — a focal point for exhibitions, concerts, and lectures, as well as being an important academic institution in its own right. Without the tireless work of Vestermanis, it is uncertain how much of the museum’s work would have been possible. For his endeavours, he has been awarded the prestigious Herbert-Samuel Prize for “having educated others to develop historical veracity and tolerance,” as well as an honorary doctorate from the Latvian Academy of Science. He has also been honoured with Latvia’s highest award, the Order of Three Stars. In a show of respect and admiration, Latvia’s State Secretary Pildegovics , the ambassadors of Austria, Israel, Hungary, and Germany attended the latest award ceremony on Sept. 18, which took place at the University of Latvia in Riga. 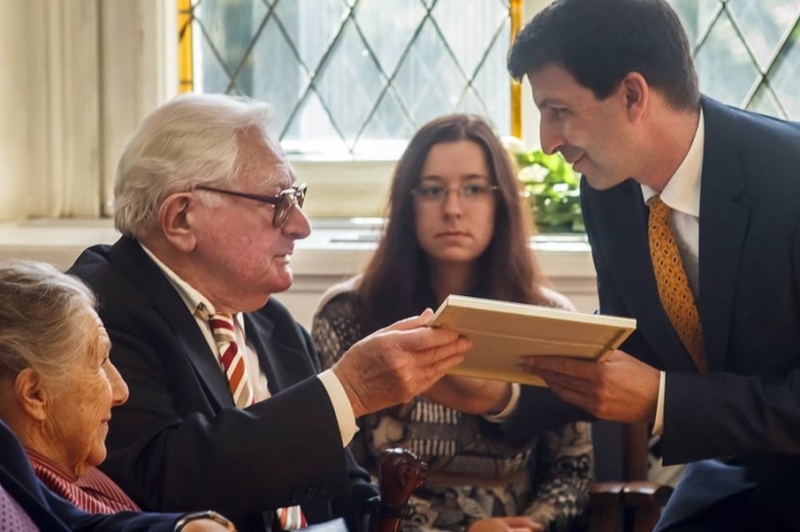 Vestermanis noted that he greatly appreciated receiving the Austrian Holocaust Memorial Award on his 90th birthday, and heartily thanked the Austrian Ambassador. Vestermanis himself, however, thinks his work is anything but complete. There is still a long way to go down the road of historical rediscovery, he believes. He pointed out that a new exhibition at the museum is on its way. Tobias Wirthmiller is researching the history of Jews in Latvia as part of his national service for the Austrian Service Abroad. He volunteers at the museum Jews in Latvia.